A time exposure captures the fiery ascent of a SpaceX Falcon 9 rocket blasting off from the Cape Canaveral Air Force Station. 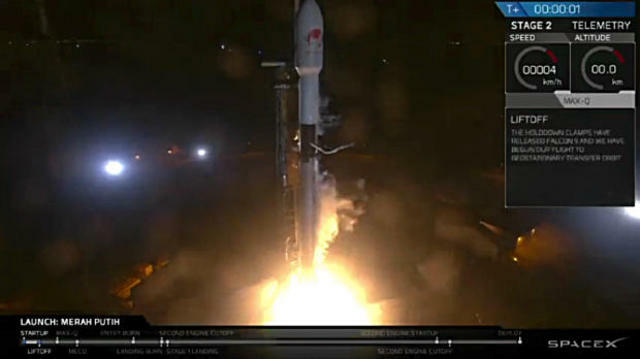 SpaceX launched the first previously-flown ‘block 5’ version of its Falcon 9 rocket early Tuesday, sending an Indonesian communications satellite into space and successfully recovering the first stage booster with a pinpoint landing on an offshore droneship. It was only the fourth flight of an upgraded block 5 booster since the rocket’s debut in May and the first launch and recovery of a previously flown block 5, the same stage that helped launch a Bangladeshi satellite during its maiden flight three months ago. The block 5 is the rocket SpaceX founder Elon Musk is counting on to launch astronauts to the International Space Station starting next year, the centerpiece of the company’s drive to lower launch costs while improving reliability. With Tuesday’s flight, SpaceX’s record stands at at 60 successful Falcon 9 launches, with 28 successful booster recoveries, 12 on land and 16 on droneships. The primary goal of Tuesday’s flight was to boost the Merah Putih, ‘Red and White’, communications satellite into orbit for PT Telkom, the largest provider of telecommunications services in Indonesia. The name refers to the red and while colors of Indonesia’s flag. The mission got underway at 1:18 a.m. EDT (GMT-4) when the Falcon 9’s nine Merlin 1D engines ignited and throttled up to full thrust, producing a brilliant plume of fiery exhaust that instantly turned cooling water into billowing clouds of steam. After a final lightning-fast series of computer checks, the 229-foot-tall rocket was released from pad 40 at the Cape Canaveral Air Force Station, quickly accelerating skyward atop 1.7 million pounds of thrust. 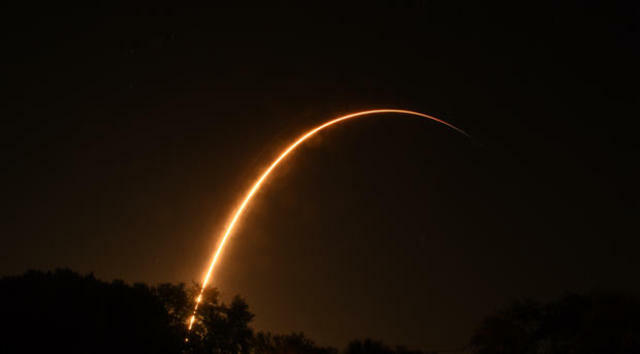 With its fiery exhaust plume visible for dozens of miles around, the Falcon 9 smoothly arced away to the east over the Atlantic Ocean, putting on a spectacular overnight display for area residents and tourists who stayed up late to catch a glimpse of the show. The first stage powered the vehicle out of the dense lower atmosphere, shutting down as planned about two-and-a-half-minutes after liftoff. The stage then fell away to begin its trip back to Earth while the primary mission continued on the power of a single Merlin engine in the rocket’s second stage. A few minutes after separation, three of the first stage’s nine engines re-ignited to slow the booster for entry back into the discernible atmosphere, using four titanium ‘grid fins’ at the top of the rocket to maintain its orientation and trajectory. A final single-engine burn put the brakes on for landing on the droneship ‘Of Course I Still Love You’ stationed several hundred miles east of Cape Canaveral. Seconds before touchdown, four legs deployed and the rocket settled to an on-target landing. After it is hauled back to Cape Canaveral, it will be inspected and, if no major problems are found, it will go into the stockpile of available block 5 stages ready for use in downstream missions. The first stage landed right about the same time the second stage engine shut down after reaching the planned preliminary ‘parking’ orbit. A second engine firing was carried out 26 minutes after launch to finish the job. The Merah Putih satellite then was released into an elliptical transfer orbit, the normal first step in getting a communications satellite into its intended orbit 22,300 miles above the equator. Satellites at such geosynchronous altitudes take 24 hours to complete one orbit and thus appear stationary in the sky. Merah Putih’s on-board propulsion system will be used to circularize the orbit at the intended 22,300-mile altitude and to maneuver it to its designated operational location at 108 degrees east longitude. After extensive testing and checkout, the satellite will be put into service. Next up for SpaceX is launch of Telesat’s Telstar 18 VANTAGE communications station from Cape Canaveral around August 17, followed by launch of an Earth-observation satellite for Argentina. That flight is scheduled for launch next month from Vandenberg Air Force Base in California.